Introduction: Dipeptidyl peptidase-4 (DPP-4) inhibitors are a class of oral antidiabetic agents for the treatment of type 2 diabetes mellitus, which lower blood glucose without causing severe hypoglycemia. However, the first cardiovascular (CV) safety trials have only recently reported their results, and our understanding of these therapies remains incomplete. Using clinical trial simulations, we estimated the effectiveness of DPP-4 inhibitors in preventing major adverse cardiovascular events (MACE) in a population like that enrolled in the SAVOR-TIMI (the Saxagliptin Assessment of Vascular Outcomes Recorded in Patients with Diabetes Mellitus – Thrombolysis in Myocardial Infarction) 53 trial. Methods: We used the Archimedes Model to simulate a clinical trial of individuals (N=11,000) with diagnosed type 2 diabetes and elevated CV risk, based on established disease or multiple risk factors. The DPP-4 class was modeled with a meta-analysis of HbA1c and weight change, pooling results from published trials of alogliptin, linagliptin, saxagliptin, sitagliptin, and vildagliptin. The study treatments were added-on to standard care, and outcomes were tracked for 20 years. Results: The DPP-4 class was associated with an HbA1c drop of 0.66% (0.71%, 0.62%) and a weight drop of 0.14 (-0.07, 0.36) kg. These biomarker improvements produced a relative risk (RR) for MACE at 5 years of 0.977 (0.968, 0.986). The number needed to treat to prevent one occurrence of MACE at 5 years was 327 (233, 550) in the elevated CV risk population. Conclusion: Consistent with recent trial publications, our analysis indicates that DPP-4 inhibitors do not increase the risk of MACE relative to the standard of care. This study provides insights about the long-term benefits of DPP-4 inhibitors and supports the interpretation of the published CV safety trial results. Regulatory agencies, such as the US Food and Drug Administration’s Center for Drug Evaluation and Research, require that drugs be established as safe and effective prior to approval. The approval process relies on the evidence-based medicine hierarchy of evidence quality, in which the randomized controlled clinical trial (RCT) is the gold standard method for quantifying the efficacy and safety of therapeutic agents.1 In recent years, regulatory agencies have taken a more conservative position on approving new medicines that potentially have negative effects on cardiovascular (CV) risk. For example, the approval of antidiabetic agents now often requires a large CV safety trial,2 creating a substantial barrier to the development of new therapies. Prospective RCTs are considered to be the only approach that is “hypothesis validating”,3 thus the only way to establish safety and efficacy. However, in practice, RCTs can be used to test only a limited number of hypotheses because they are expensive and time-consuming to perform. Clinical trial simulation represents a complementary, “hypothesis generating”, approach for forecasting the findings of RCTs yet to be completed, and exploring the possible drivers of RCT results.4 Clinical trial simulation cannot replace the RCT, but could be valuable in disease areas such as type 2 diabetes and cardiovascular disease (CVD), where trial protocols are often complex, and powering trials require large populations with multiyear follow-up. These critically important trials sometimes yield results that are challenging to interpret. A number of clinical trial simulation methods have been used to predict or interpret the results from trials of type 2 diabetes and CVD. Individual-level Markov models are the least mathematically complex technique for clinical trial simulation, and have been applied to problems in health care for over four decades.5 In a simple Markov model, an individual’s health is categorized by discrete states, and individuals move from state to state with invariant probabilities at fixed time intervals. However, describing an individual’s health with a small number of discrete states is a coarse approximation because human physiology is complex and continuous in nature.6 A related limitation of simple Markov models is the invariant state transition probability. In reality, an individual’s health evolves continuously over time, but the time evolution of risk is lost in the Markov framework. These limitations have been addressed by extending the Markov model framework with tracker variables (such as glycated hemoglobin [HbA1c]) that evolve over the course of a simulation and disease submodels that capture a richer representation of comorbidities. The United Kingdom Prospective Diabetes Study (UKPDS) outcomes model7 is one of the more commonly used examples of this class of model. The UKPDS model is an individual-level state transition model with annual cycles, functionalized transition probabilities based on disease status, four biomarkers as continuous variables (HbA1c, blood pressure, total cholesterol, high-density lipoprotein cholesterol [HDL-C]), and a discrete smoking status risk factor. The risks of adverse events during each 1-year period are computed as functions of the individual’s disease status and biomarkers. Meta-simulation of clinical trials using observational patient records represents a novel approach to clinical trial simulation. 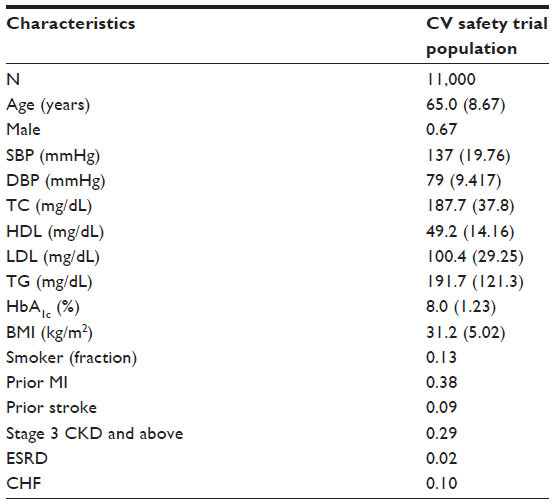 Chan et al employed meta-simulation of a published landmark clinical trial and compared the meta-simulation and trial results.4 The meta-simulated trial replicated the protocol of the Die Deutsche Diabetes Dialyse Studie (The German Diabetes Dialysis Study, 4D Study),15 and estimated the effectiveness of statins in preventing CV outcomes among dialysis patients. By mimicking the protocol of the 4D Study, the investigators vetted their approach by comparing their findings to those from a published RCT. In the meta-simulation, the cohort was constructed by applying the inclusion criteria of the 4D Study to a large observational data set containing longitudinal records for 115,000 patients with end-stage renal disease. The investigators allocated individuals who began taking statins at some point during their dialysis treatment to a hypothetical intervention arm. Individuals who never took statins in the database were matched to individuals in the intervention arm, on the basis of similar risk factors, forming a matched control arm. The Chan study demonstrates that meta-simulation can produce treatment effect hazard ratios that are numerically similar to those of a prospective RCT. Further, the 4D Study’s findings for the primary outcome were not statistically significant, whereas the meta-simulation findings were significant due to a sample size nearly ten times larger than that of the RCT. This underscores the strength of leveraging large observational data sets.16 The apparent simplicity of the approach is attractive when communicating results, as a “simulated trial” based on observed real individuals is intuitive. Observational studies are at risk of selection bias, because the subjects are not randomized to the control and intervention groups as they are in an RCT. Indeed, in the Chan study, simulated statin users were found to have a nonsignificant 15% increase in nonfatal angina or revascularization. This suggests that there may be residual confounding not addressed by the propensity scoring methods used by the investigators. A related challenge is database availability and suitability. For example, the 4D Study ran in a German setting, yet the simulated trial cohort was extracted from the US database, and the implication of a US versus European setting is difficult to fully quantify. Further, approaches based on observational data are less applicable to simulating trials with complex treatment protocols (eg, crossover designs) and novel therapies (eg, a new compound not present in observational data). The Archimedes Model is a rigorously validated simulation model of human physiology, chronic disease, and health care delivery systems.19,20 The model is based on a set of coupled mathematical equations that represent the physiological pathways of chronic diseases and their complications. The model includes CVDs, diabetes, respiratory conditions, and a number of cancers. One unique feature of the Archimedes Model is that it spans multiple diseases and captures the linkages between diseases and disease outcomes. Within this framework, interventions are modeled so as to operate on both the disease pathways and long-term health outcomes. Being an integrated system, the Archimedes Model is suitable for addressing diseases and syndromes that span multiple organ systems, drugs that have complex effects, and combinations of drugs. Within the simulated health care system, care is delivered according to guidelines (National Cholesterol Education Program Adult Treatment Panel III, Joint National Committee on Prevention, Detection, Evaluation, and Treatment of High Blood Pressure, etc). Further, the quality of care delivered and rates of treatment are calibrated to align with US statistics, and a full report is available on the Archimedes website (http://www.archimedesmodel.com). The model also provides a suitable platform for simulating clinical trials with complex protocols and subtle interactions with routine health care delivery. The Archimedes Model is well suited to simulating clinical trials because simulated patients are based on the profiles of real people and, consequently, have correlated risk factors and biomarkers that evolve continuously over the trial period. A simulated cohort of individuals generated with the Archimedes Model has distributions and correlations of risk factors, medication usage, and medical histories reflective of real populations. The model provides facilities for selecting a cohort of simulated subjects meeting trial inclusion/exclusion criteria and then simulating each subject’s life for the duration of the trial according to the specified trial protocol. We simulated a virtual clinical trial reflective of the SAVOR-TIMI 53 trial that was underway at the time of the analysis.17 Virtual subjects were eligible for inclusion if they had been previously diagnosed with type 2 diabetes, had an HbA1c of at least 6.5% but not exceeding 12%, and had elevated CV risk. Elevated CV risk was defined as one or more of the following: at least 40 years of age and having had a previous MI or stroke; or at least 55 years old (male) or 60 years old (female) and having one of the following additional risk factors: low-density lipoprotein cholesterol over 130 mg/dL or HDL-C less than 40 mg/dL for men or less than 50 mg/dL for women, blood pressure >140/90 mmHg or >130/80 mmHg if on antihypertensive agent(s); or currently smoking. In the treatment arm, the trial DPP-4 inhibitor, representative of the class-level effects, was added on to standard diabetes care. In the comparator arm, standard diabetes care was delivered. However in all arms, no incretin-based therapies other than the target DPP-4 inhibitor were permitted. The target treatment was initiated immediately after baseline, and subjects were 100% adherent throughout the simulation. Individuals were tracked for 20 years. No loss to follow-up or other censoring was assumed, except for that due to mortality. The trial simulations were designed and analyzed using the ARCHeS suite, version 2.4, which provides a Web-based interface for setting up and analyzing Archimedes Model simulations.21 The simulated population consisted of a sample of 11,000 patients, which is the prespecified sample size of the ARCHeS platform. The same sample of patients is run through each trial arm, substantially reducing the stochastic variability between arms; thus, this sample size was more than sufficient to derive statistically sound estimates of the primary end point. The doses of any antidiabetic drug, except insulin, were different from the maximum dose currently recommended in clinical practice. These criteria corresponded to the following compounds and doses: alogliptin 25 mg QD, linagliptin 5 mg QD, saxagliptin 5 mg QD, sitagliptin 100 mg QD, and vildagliptin 50 mg BID and 100 mg QD. In the meta-analysis, studies were weighted by the inverse of the sample variance. Absolute HbA1c change from baseline was analyzed with a mixed effects model including a moderator for baseline HbA1c. A random effects analysis was employed for absolute weight change from baseline. Meta-analyses were performed with the package metafor and R version 2.13.0. We found that effects on lipids were not consistently reported and were often not statistically significant in literature. Effects on triglycerides were the most consistently statistically significant in the trials examined. However, the direct lipid CV risk factors in the Archimedes Model are total cholesterol and HDL-C. 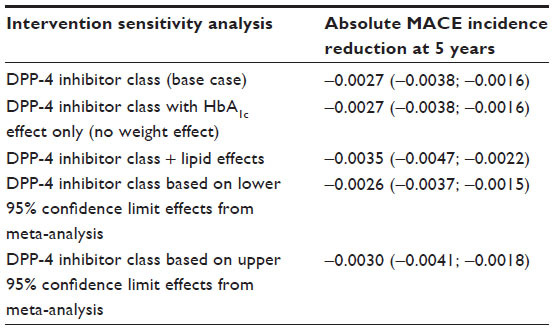 Therefore, effects on lipids were not included in the primary analysis, but were explored in the sensitivity analysis. The primary study outcome was the occurrence of MACE, defined as the first occurrence of MI, stroke, or death from CV causes. The cumulative incidence of the first occurrence of MACE in each trial arm was reported as a Kaplan–Meier survival estimate, starting from study initiation. The relative effectiveness of each treatment scenario was evaluated using relative risk (RR), and the absolute benefit was evaluated using the number needed to treat (NNT) to prevent one additional event over 5 years of follow-up. The RR estimates were computed as the ratio of the number of events in the intervention scenario by the number of events in the standard of care scenario. The standard error of the RR was estimated accounting for the correlation between arms due to the fact that identical sets of patients were simulated in each arm. This leads to smaller confidence intervals and P-values than might be expected for a similar RCT in which the arms are independent. The NNT values were derived from the Kaplan–Meier survival estimates using the method of Altman and Andersen,27 comparing add-on DPP-4 inhibitor to standard of care. Standard error computations for comparative statistics also took into account correlation between trial arms. All confidence estimates reflect the statistical uncertainty resulting from the stochastic nature of the Archimedes Model. The uncertainty associated with the modeling assumptions is explored through sensitivity analyses. Our meta-analysis yielded an estimate of the DPP-4 inhibitor class effect on HbA1c of −0.66% (−0.71%, −0.62%), for a population with a baseline HbA1c of 8.0% (τ2=0.02). The estimated effect on weight was −0.14 (−0.36, 0.07) kg (I2=90). A list of the studies included in the meta-analysis is provided in Table S1. These effects were used as the base case DPP-4 inhibitor class treatment model in the subsequent clinical trial simulations. 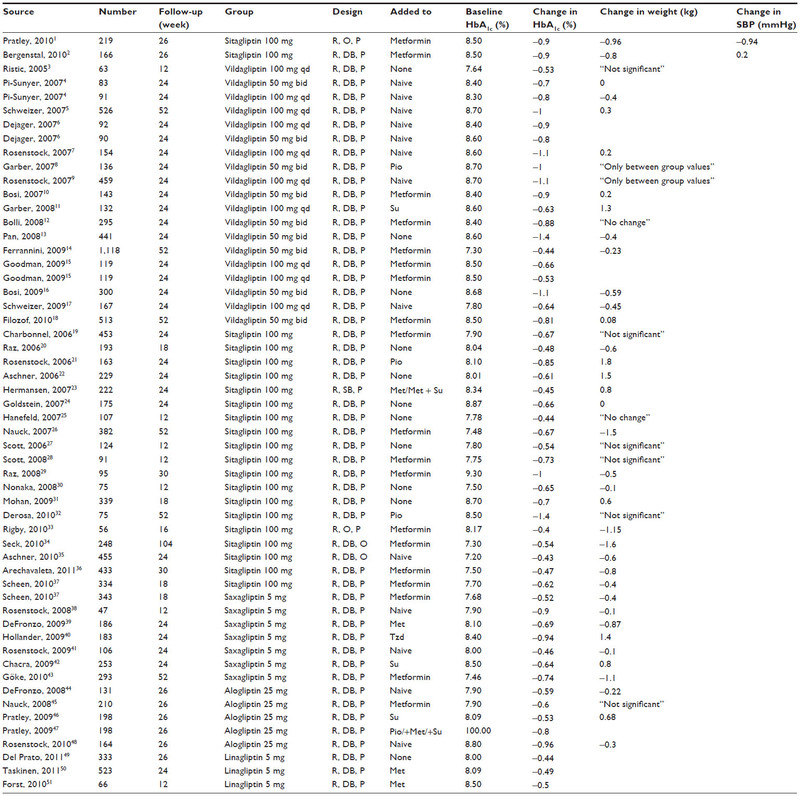 The baseline characteristics of the simulated cohort reflected those of the actual SAVOR-TIMI 53 cohort, as shown in Table S2. Treatment with the DPP-4 inhibitor class was associated with an HbA1c drop of 0.66% (0.71%, 0.62%) and a weight reduction of 0.14 (0.36, −0.07) kg at 1 year, consistent with the meta-analysis and simulated study design. At 5 years, the cumulative number of MACE was 1,507 (1,355, 1,658) and 1,467 (1,319, 1,616) in the comparator and intervention arms, respectively. At 5 years, the incidence of MACE was 0.134 (0.128, 0.141) and 0.131 (0.125, 0.138) in the comparator and intervention arms, respectively, as shown in Figure 1. This corresponded to a 5-year RR for MACE of 0.977 (0.968, 0.986). The CV neutrality of the DPP-4 inhibitor was fairly consistent with a 20-year RR for MACE of 0.982 (0.977, 0.986). The modest effect of the DPP-4 inhibitor on the primary end point yielded a 5-year NNT of 327 (233, 550). 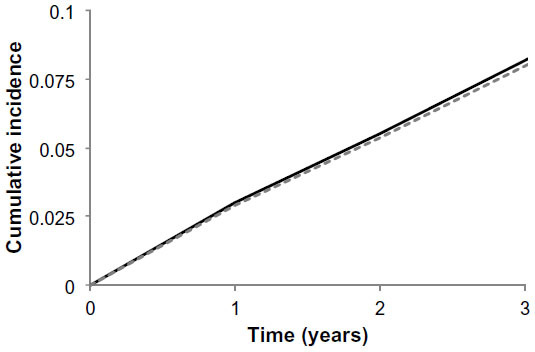 Figure 1 The Kaplan–Meier cumulative incidence of MACE. Notes: The solid black and dashed gray lines correspond to the standard of care and DPP-4 inhibitor treatment arms, respectively. MACE was defined as the first occurrence of MI, stroke, or cardiovascular death. Abbreviations: MACE, major adverse cardiovascular events; MI, myocardial infarction. Results from the sensitivity analyses quantifying how our modeling assumptions impacted the simulation results are presented in Table S3. Each sensitivity analysis constituted an alternate treatment scenario. The sensitivity of the results to variations in the assumptions was evaluated based on the absolute change in the cumulative incidence of MACE at 5 years. Four decades ago, researches began to employ state transition models to better understand the most complex processes in health care.5 Today, the planning, execution, and interpretation of the clinical trials required to establish drug safety and efficacy stand as one of the major barriers to improving the treatment of chronic diseases such as diabetes. The potential health benefits associated with new therapeutics for diabetes and CVD, as well as the staggering resource consumption associated with bringing new compounds to market, motivate advancements in simulation methods for clinical trials. The restrictions imposed by the Markov modeling framework limit their utility for clinical trial simulation, particularly when predictions are needed over longer time scales and in cases of interacting diseases, such as diabetes and CVD, which cannot be represented effectively with a limited number of “states”. Meta-simulation based on observational data represents an emerging area of clinical trial simulation. If suitable observational data sets are available, then this approach is an attractive option due to the simplicity of the methodology (both in statistical modeling and in communication). However, conclusions obtained with this approach can be biased, as with all observational studies. The Archimedes Model, a continuous-time/discrete-event simulation model, can provide a rich representation of human physiology and health care systems. However, the model is more complex than most other methods, and thus is best suited to research problems where accuracy and clinical detail are required. One such application is simulating the outcomes of trials where the underlying disease evolution is complex, such as the present analysis of diabetes and CVD. For this application, the Archimedes Model is unique in its ability to capture trial protocols and forecast event rates in the high-risk populations typical of CV safety RCTs. In this analysis, we simulated the SAVOR-TIMI 53 study, prospectively, and first reported our results at the International Society for Pharmacoeconomics and Outcomes Research Annual European Congress (abstract with findings submitted on June 25, 2013). Our simulated study suggests that DPP-4 inhibitors do not increase the risk of MACE relative to the standard of care in a population with elevated CV risk. These findings agree with the CV neutral findings of the SAVOR-TIMI 53 (hazard ratio for treatment with saxagliptin of 1.00 [95% CI, 0.89–1.12]) and those of the EXAMINE trials (hazard ratio for treatment with alogliptin, 0.96; upper boundary of the one-sided repeated confidence interval, 1.16)29 for the respective primary composite CV end points. Further, our analysis estimates the clinical impact of DPP-4 inhibitor treatment over a time horizon of 20 years, which is substantially longer than the trial follow-up times. Both of these trials reported their results after our simulation work was complete. The agreement between the simulations and trial findings suggests that the benefits of DPP-4 inhibitors are largely consistent with the traditional linkages between HbA1c, weight, and CV outcomes captured in the Archimedes Model. Our sensitivity analyses explored the potential variability of our findings to alternate DPP-4 inhibitor modeling assumptions, and all sensitivity analyses lead to the conclusion that DPP-4 inhibitors are CV neutral. Clinical trial simulations, like the present analysis, are valuable, yet they do have limitations and cannot yet replace RCTs. First, models that are largely statistical in nature, like the Archimedes Model, cannot predict intervention effects that have not yet been observed. In particular, the approach we have employed did not consider the occurrence of serious adverse drug events. Our simulation would not have been consistent with the SAVOR-TIMI 53 trial results, should there have been a substantial additional CV effect of DPP-4 inhibitors (beneficial or harmful) beyond those previously associated with HbA1c and weight changes. In fact, in the SAVOR-TIMI 53 trial, more patients in the saxagliptin group than in the placebo group were hospitalized for heart failure (HF) (hazard ratio, 1.27; 95% CI, 1.07–1.51; P=0.007), yet our simulations forecast lower rates of HF in the DPP-4 inhibitor group in sharp contrast to the trial findings. Additionally, a recent retrospective analysis of claims data found that sitagliptin use was associated with an increased risk of HF-related hospitalizations among patients with type 2 diabetes with preexisting HF.30 Resolving this possible association between some DPP-4 inhibitors and HF will require additional trials and potentially more simulations. In such cases, clinical trial simulation may still be valuable, quantifying the magnitude of newly discovered effects, versus those associated with traditional risk factor changes. Second, clinical trial simulation depends on data inputs typically obtained through evidence synthesis and meta-analysis. In the present analysis, we observed substantial heterogeneity between the trials. We used standard meta-regression techniques to mitigate the heterogeneity, but the presence of heterogeneity suggests some uncertainty in the magnitude of the DPP-4 class effects on biomarkers, which propagates through to our final event rate estimates. Third, our simulation does not account for secular trends in either the impact of DPP-4 inhibitors or in the treatment guidelines that determine standard of care. All told, this study provides insights about the long-term benefits of DPP-4 inhibitors for individuals with diabetes and supports the interpretation of the CV safety trial results now available. The authors thank Tina Yeung and Swathi Guda for their assistance with the research work. We presented the work as a poster at the 16th ISPOR Annual European Congress in Dublin, in 2013. This research was sponsored by Novartis Pharma AG and conducted by Archimedes, Inc. as consultants for Novartis. Charles Andy Schuetz was an employee of Archimedes, Inc., at that time. Siew Hwa Ong is an employee of Novartis Pharma AG. Matthias Blüher has received honoraria as a speaker from AstraZeneca, Bayer, Boehringer-Ingelheim, Lilly, Novartis, Novo Nordisk, Sanofi, MSD, and Pfizer, and also as part of an advisory board for AstraZeneca, Boehringer-Ingelheim, Lilly, Novartis, Novo Nordisk, Sanofi. Concato J, Shah N, Horwitz RI. Randomized, controlled trials, observational studies, and the hierarchy of research designs. N Engl J Med. 2000;342(25):1887–1892. Food and Drug Administration, Center for Drug Evaluation and Research (CDER). Guidance for Industry. Diabetes Mellitus – Evaluating, Cardiovascular Risk in New, Antidiabetic Therapies to Treat Type 2 Diabetes. Silver Spring, MD, USA: Food and Drug Administration, Center for Drug Evaluation and Research (CDER); 2008. Byar DP, Simon RM, Friedewald WT, et al. Randomized clinical trials. Perspectives on some recent ideas. N Engl J Med. 1976;295(2):74–80. Chan KE, Thadhani R, Lazarus JM, Hakim RM. Modeling the 4D Study: statins and cardiovascular outcomes in long-term hemodialysis patients with diabetes. Clin J Am Soc Nephrol. 2010;5(5):856–866. Gersch W, Eddy DM, Dong E Jr. Cardia arrhythmia classification: a heart-beat interval-Markov chain approach. Comput Biomed Res. 1970;3(4):385–392. Eddy DM, Schlessinger L, Kahn R. Clinical outcomes and cost-effectiveness of strategies for managing people at high risk for diabetes. Ann Intern Med. 2005;143(4):251–264. Clarke PM, Gray AM, Briggs A, et al. A model to estimate the lifetime health outcomes of patients with type 2 diabetes: the United Kingdom Prospective Diabetes Study (UKPDS) Outcomes Model (UKPDS no 68). Diabetologia. 2004;47(10):1747–1759. Hayes AJ, Leal J, Gray AM, Holman RR, Clarke PM. UKPDS outcomes model 2: a new version of a model to simulate lifetime health outcomes of patients with type 2 diabetes mellitus using data from the 30 year United Kingdom Prospective Diabetes Study: UKPDS 82. Diabetologia. 2013;56(9):1925–1933. Kengne AP, Patel A, Colagiuri S, et al. The Framingham and UK Prospective Diabetes Study (UKPDS) risk equations do not reliably estimate the probability of cardiovascular events in a large ethnically diverse sample of patients with diabetes: the Action in Diabetes and Vascular Disease: Preterax and Diamicron-MR Controlled Evaluation (ADVANCE) Study. Diabetologia. 2010;53(5):821–831. Palmer AJ, Roze S, Valentine WJ, et al. The CORE Diabetes Model: projecting long-term clinical outcomes, costs and cost-effectiveness of interventions in diabetes mellitus (types 1 and 2) to support clinical and reimbursement decision-making. Curr Med Res Opin. 2004;20(Suppl 1):S5–S26. Palmer AJ, Roze S, Valentine WJ, et al. Validation of the CORE Diabetes Model against epidemiological and clinical studies. Curr Med Res Opin. 2004;20(Suppl 1):S27–S40. Michigan Model for Diabetes, 2009. Available from: http://www.med.umich.edu/mdrtc/cores/DiseaseModel/model.htm. Accessed April 1, 2015. Barhak J, Isaman DJ, Ye W, Lee D. Chronic disease modeling and simulation software. J Biomed Inform. 2010;43(5):791–799. Grant D, Foos V, Palmer J, Lloyd A, Evans M, McEwan P. Long-term validation of the IMS CORE Diabetes Model in Type 1 and Type 2 diabetes. Presented at: The 72nd Scientific Sessions of the American Diabetes Association (ADA), June 8–12, 2012, Philadelphia, PA, USA. Wanner C, Krane V, Ruf G, Marz W, Ritz E. Rationale and design of a trial improving outcome of type 2 diabetics on hemodialysis. Die Deutsche Diabetes Dialyse Studie Investigators. Kidney Int Suppl. 1999;71:S222–S226. Tuttle KR. Charting new territory by simulated modeling of a clinical trial. Clin J Am Soc Nephrol. 2010;5(5):750–752. Scirica BM, Bhatt DL, Braunwald E, et al. The design and rationale of the saxagliptin assessment of vascular outcomes recorded in patients with diabetes mellitus-thrombolysis in myocardial infarction (SAVOR-TIMI) 53 study. Am Heart J. 2011;162(5):818–825. e816. Scirica BM, Bhatt DL, Braunwald E, et al. Saxagliptin and cardiovascular outcomes in patients with type 2 diabetes mellitus. N Engl J Med. 2013;369(14):1317–1326. Eddy DM, Schlessinger L. Validation of the Archimedes diabetes model. Diabetes Care. 2003;26(11):3102–3110. Eddy DM, Schlessinger L. Archimedes: a trial-validated model of diabetes. Diabetes Care. 2003;26(11):3093–3101. Archimedes, Inc. Healthcare Modeling. San Francisco, CA: Archimedes, Inc. Available from: http://archimedesmodel.com/. Accessed April 1, 2015. Schlessinger L, Eddy DM. Archimedes: a new model for simulating health care systems – the mathematical formulation. J Biomed Inform. 2002;35(1):37–50. Schuetz CA, van Herick A, Alperin P, Peskin B, Hsia J, Gandhi S. Comparing the effectiveness of rosuvastatin and atorvastatin in preventing cardiovascular outcomes: estimates using the Archimedes model. J Med Econ. 2012;15(6):1118–1129. van Herick A, Schuetz CA, Alperin P, Bullano MF, Balu S, Gandhi S. The impact of initial statin treatment decisions on cardiovascular outcomes in clinical care settings: estimates using the Archimedes Model. Clinicoecon Outcomes Res. 2012;4:337–347. Mosenzon O, Raz I, Scirica BM, et al. Baseline characteristics of the patient population in the Saxagliptin Assessment of Vascular Outcomes Recorded in patients with diabetes mellitus (SAVOR)-TIMI 53 trial. Diabetes Metab Res Rev. 2013;29(5):417–426. Esposito K, Chiodini P, Bellastella G, Maiorino MI, Giugliano D. Proportion of patients at HbA1c target <7% with eight classes of antidiabetic drugs in type 2 diabetes: systematic review of 218 randomized controlled trials with 78 945 patients. Diabetes Obes Metab. 2012;14(3):228–233. Altman DG, Andersen PK. Calculating the number needed to treat for trials where the outcome is time to an event. BMJ. 1999;319(7223):1492–1495. Monami M, Lamanna C, Desideri CM, Mannucci E. DPP-4 inhibitors and lipids: systematic review and meta-analysis. Adv Ther. 2012;29(1):14–25. White WB, Cannon CP, Heller SR, et al. Alogliptin after acute coronary syndrome in patients with type 2 diabetes. N Engl J Med. 2013;369(14):1327–1335. Weir DL, McAlister FA, Senthilselvan A, Minhas-Sandhu JK, Eurich DT. Sitagliptin use in patients with diabetes and heart failure: a population-based retrospective cohort study. JACC Heart Fail. 2014; 2(6):573–582. Abbreviations: HbA1c, glycated hemoglobin; Tzd, thiazolidinediones; Met, metformin; Su, sulfonylurea; Pio, Pioglitazone; SBP, systolic blood pressure; R, randomized trial; DB, double-blind trial; SB, single-blind trial; O, open-label trial; P, parallel-group trial. Notes: Values are means with standard deviations in parentheses unless otherwise indicated. Abbreviations: N, number in sample; BMI, body mass index; TC, total cholesterol; HDL, high-density lipoprotein cholesterol; LDL, low-density lipoprotein cholesterol; TG, triglycerides; SBP, systolic blood pressure; DBP, diastolic blood pressure; MI, myocardial infarction; CKD, chronic kidney disease; ESRD, end-stage renal disease; CHF, chronic heart failure; CV, cardiovascular; HbA1c, glycated hemoglobin; SAVOR-TIMI, the Saxagliptin Assessment of Vascular Outcomes Recorded in Patients with Diabetes Mellitus – Thrombolysis in Myocardial Infarction. Notes: For reference, in the standard of care arm the incidence of MACE at 5 years was 0.1253 (0.1189; 0.1316). MACE was defined as the first occurrence of MI, stroke, or cardiovascular death. Abbreviations: MACE, major adverse cardiovascular events; DPP-4, dipeptidyl peptidase-4; HbA1c, glycated hemoglobin; MI, myocardial infarction. Pratley RE, Nauck M, Bailey T, et al. Liraglutide versus sitagliptin for patients with type 2 diabetes who did not have adequate glycaemic control with metformin: a 26-week, randomised, parallel-group, open-label trial. Lancet. 2010;375(9724):1447–1456. Bergenstal RM, Wysham C, MacConell L, et al. Efficacy and safety of exenatide once weekly versus sitagliptin or pioglitazone as an adjunct to metformin for treatment of type 2 diabetes (DURATION-2): a randomised trial. Lancet. 2010;376(9739):431–439. Ristic S, Byiers S, Foley, Holmes D. Improved glycaemic control with dipeptidyl peptidase-4 inhibition in patients with type 2 diabetes: vildagliptin (LAF237) dose response. Diabetes Obes Metab. 2005;7(6):692–698. Pi-Sunyer FX, Schweizer A, Mills D, Dejager S. Efficacy and tolerability of vildagliptin monotherapy in drug-naive patients with type 2 diabetes. Diabetes Res Clin Pract. 2007;76(1):132–138. Schweizer A, Couturier A, Foley JE, Dejager S. Comparison between vildagliptin and metformin to sustain reductions in HbA1c over 1 year in drug-naïve patients with Type 2 diabetes. Diabetic Med. 2007;24(9):955–961. Dejager S, Razac S, Foley JE, Schweizer A. Vildagliptin in drug-naïve patients with type 2 diabetes: a 24-Week, double-blind, randomized, placebo-controlled, multiple-dose study. Horm Metab Res. 2007;39(3):218–223. Rosen stock J, Kim SW, Baron MA, et al. Efficacy and tolerability of initial combination therapy with vildagliptin and pioglitazone compared with component monotherapy in patients with type 2 diabetes. Diabetes Obes Metab. 2007;9(2):175–185. Garber AJ, Schweizer A, Baron MA, Rochotte E, Dejager S. Vildagliptin in combination with pioglitazone improves glycaemic control in patients with type 2 diabetes failing thiazolidinedione monotherapy: a randomized, placebo-controlled study. Diabetes Obes Metab. 2007;9(2):166–174. Rosenstock J, Baron MA, Dejager S, Mills D, Schweizer A. Comparison of vildagliptin and rosiglitazone monotherapy in patients with Type 2 diabetes. Diabetes Care. 2007;30(2):217–223. Bosi E, Camisasca RP, Collober C, Rochotte E, Garber AJ. Effects of vildagliptin on glucose control over 24 weeks in patients with type 2 diabetes inadequately controlled with metformin. Diabetes Care. 2007;30(4):890–895. Garber AJ, Foley JE, Banerji MA, et al. Effects of vildagliptin on glucose control in patients with type 2 diabetes inadequately controlled with a sulphonylurea. Diabetes Obes Metab. 2008;10(11):1047–1056. Bolli G, Dotta F, Rochotte E, Cohen SE. Efficacy and tolerability of vildagliptin vs. pioglitazone when added to metformin: a 24-week, randomized, double-blind study. Diabetes Obes Metab. 2008;10(1):82–90. Pan C, Yang W, Barona JP, et al. Comparison of vildagliptin and acarbose monotherapy in patients with Type 2 diabetes: a 24-week, double-blind, randomized trial. Diabetic Med. 2008;25(4):435–441. Ferrannini E, Fonseca V, Zinman B, et al. Fifty-two-week efficacy and safety of vildagliptin vs. glimepiride in patients with type 2 diabetes mellitus inadequately controlled on metformin monotherapy. Diabetes Obes Metab. 2009;11(2):157–166. Goodman M, Thurston H, Penman J. Efficacy and tolerability of vildagliptin in patients with type 2 diabetes inadequately controlled with metformin monotherapy. Horm Metab Res. 2009;41(5):368–373. Bosi E, Dotta F, Jia Y, Goodman M. Vildagliptin plus metformin combination therapy provides superior glycaemic control to individual monotherapy in treatment-naive patients with type 2 diabetes mellitus. Diabetes Obes Metab. 2009;11(5):506–515. Schweizer A, Dejager S, Bosi E. Comparison of vildagliptin and metformin monotherapy in elderly patients with type 2 diabetes: a 24-week, double-blind, randomized trial. Diabetes Obes Metab. 2009;11(8):804–812. Filozof C, Gautier JF.A comparison of efficacy and safety of vildagliptin and gliclazide in combination with metformin in patients with Type 2 diabetes inadequately controlled with metformin alone: a 52-week, randomized study. Diabetic Med. 2010;27(3):318–326. Charbonnel B, Karasik A, Liu J, Wu M, Meininger G. Efficacy and safety of the dipeptidyl peptidase-4 inhibitor sitagliptin added to ongoing metformin therapy in patients with type 2 diabetes inadequately controlled with metformin alone. Diabetes Care. 2006;29(12):2638–2643. Raz I, Hanefeld M, Xu L, Caria C, Williams-Herman D, Khatami H. Efficacy and safety of the dipeptidyl peptidase-4 inhibitor sitagliptin as monotherapy in patients with type 2 diabetes mellitus. Diabetologia. 2006;49(11):2564–2571. Rosenstock J, Brazg R, Andryuk PJ, Lu K, Stein P. Efficacy and safety of the dipeptidyl peptidase-4 inhibitor sitagliptin added to ongoing pioglitazone therapy in patients with type 2 diabetes: a 24-week, multicenter, randomized, double-blind, placebo-controlled, parallel-group study. Clin Ther. 2006;28(10):1556–1568. Aschner P, Kipnes MS, Lunceford JK, Sanchez M, Mickel C, Williams-Herman DE. Effect of the dipeptidyl peptidase-4 inhibitor sitagliptin as monotherapy on glycemic control in patients with type 2 diabetes. Diabetes Care. 2006;29(12):2632–2637. Hermansen K, Kipnes M, Luo E, Fanurik D, Khatami H, Stein P. Efficacy and safety of the dipeptidyl peptidase-4 inhibitor, sitagliptin, in patients with type 2 diabetes mellitus inadequately controlled on glimepiride alone or on glimepiride and metformin. Diabetes Obes Metab. 2007;9(5):733–745. Goldstein BJ, Feinglos MN, Lunceford JK, Johnson J, Williams-Herman DE. Effect of initial combination therapy with sitagliptin, a dipeptidyl peptidase-4 inhibitor, and metformin on glycemic control in patients with type 2 diabetes. Diabetes Care. 2007;30(8):1979–1987. Hanefeld M, Herman GA, Wu M, Mickel C, Sanchez M, Stein PP. Once-daily sitagliptin, a dipeptidyl peptidase-4 inhibitor, for the treatment of patients with type 2 diabetes. Curr Med Res Opin. 2007;23(6):1329–1339. Nauck MA, Meininger G, Sheng D, Terranella L, Stein PP. Efficacy and safety of the dipeptidyl peptidase-4 inhibitor, sitagliptin, compared with the sulfonylurea, glipizide, in patients with type 2 diabetes inadequately controlled on metformin alone: a randomized, double-blind, non-inferiority trial. Diabetes Obes Metab. 2007;9(2):194–205. Scott R, Wu M, Sanchez M, Stein P. Efficacy and tolerability of the dipeptidyl peptidase-4 inhibitor sitagliptin as monotherapy over 12 weeks in patients with type 2 diabetes. Int J Clin Pract. 2007;61(1):171–180. Scott R, Loeys T, Davies MJ, Engel SS. Efficacy and safety of sitagliptin when added to ongoing metformin therapy in patients with type 2 diabetes. Diabetes Obes Metab. 2008;10(10):959–969. Raz I, Chen Y, Wu M, et al. Efficacy and safety of sitagliptin added to ongoing metformin therapy in patients with type 2 diabetes. Curr Med Res Opin. 2008;24(2):537–550. Nonaka K, Kakikawa T, Sato A, et al. Efficacy and safety of sitagliptin monotherapy in Japanese patients with type 2 diabetes. Diabetes Res Clin Pract. 2008;79(2):291–298. Mohan V, Yang W, Son HY, et al. Efficacy and safety of sitagliptin in the treatment of patients with type 2 diabetes in China, India, and Korea. Diabetes Res Clin Pract. 2009;83(1):106–116. Derosa G, Maffioli P, Salvadeo SA, et al. Effects of sitagliptin or metformin added to pioglitazone monotherapy in poorly controlled type 2 diabetes mellitus patients. Metabolism. 2010;59(6):887–895. Rigby SP, Handelsman Y, Lai YL, Abby SL, Tao B, Jones MR. Effects of colesevelam, rosiglitazone, or sitagliptin on glycemic control and lipid profile in patients with type 2 diabetes mellitus inadequately controlled by metformin monotherapy. Endocr Pract. 2010;16(1):53–63. Seck T, Nauck M, Sheng D, et al. Sitagliptin Study 024 Group. Safety and efficacy of treatment with sitagliptin or glipizide in patients with type 2 diabetes inadequately controlled on metformin: a 2-year study. Int J Clin Pract. 2010;64(5):562–576. Aschner P, Katzeff HL, Guo H, et al. Sitagliptin Study 049 Group.Efficacy and safety of monotherapy of sitagliptin compared with metformin in patients with type 2 diabetes. Diabetes Obes Metab. 2010;12(3):252–261. Arechavaleta R, Seck T, Chen Y, et al. Efficacy and safety of treatment with sitagliptin or glimepiride in patients with type 2 diabetes inadequately controlled on metformin monotherapy: a randomized, double-blind, non-inferiority trial. Diabetes Obes Metab. 2011;13(2):160–168. Scheen AJ, Charpentier G, Ostgren CJ, Hellqvist A, Gause-Nilsson I. Efficacy and safety of saxagliptin in combination with metformin compared with sitagliptin in combination with metformin in adult patients with type 2 diabetes mellitus. Diabetes Metab Res Rev. 2010;26(7):540–549. Rosenstock J, Sankoh S, List JF. Glucose-lowering activity of the dipeptidyl peptidase-4 inhibitor saxagliptin in drug-naive patients with type 2 diabetes. Diabetes Obes Metab. 2008;10(5):376–386. DeFronzo RA, Hissa MN, Garber AJ, et al. The efficacy and safety of saxagliptin when added to metformin therapy in patients with inadequately controlled type 2 diabetes with metformin alone. Diabetes Care. 2009;32(9):1649–1655. Hollander P, Li J, Allen E, Chen R. Saxagliptin added to a thiazolidinedione improves glycemic control in patients with type 2 diabetes and inadequate control on thiazolidinedione alone. J Clin Endocrinol Metab. 2009;94(12):4810–4819. Rosenstock J, Aguilar-Salinas C, Klein E, Nepal S, List J, Chen R. Effect of saxagliptin monotherapy in treatment-naïve patients with type 2 diabetes. Curr Med Res Opin. 2009;25(10):2401–2411. Chacra AR, Tan GH, Apanovitch A, Ravichandran S, List J, Chen R. Saxagliptin added to a submaximal dose of sulphonilurea improves glucaemic control compared with uptritation of sulphonylurea in patients with type 2 diabetes: a randomized controlled trial. Intern J Clin Pract. 2009;63(9):1395–1406. Göke B, Gallwitz B, Eriksson J, Hellqvist A, Gause-Nilsson I. Saxagliptin is non-inferior to glipizide in patients with type 2 diabetes mellitus inadequately controlled on metformin alone: a 52-week randomised controlled trial. Int J Clin Pract. 2010;64(12);1619–1631. DeFronzo RA, Fleck PR, Wilson CA, Mekki Q. Efficacy and safety of the dipeptidyl peptidase-4 inhibitor alogliptin in patients with type 2 diabetes and inadequate glycemic control: a randomized, double-blind, placebo-controlled study. Diabetes Care. 2008;31(12):2315–2317. Nauck MA, Ellis GC, Fleck PR, Wilson CA, Mekki Q. Efficacy and safety of adding the dipeptidyl peptidase-4 inhibitor alogliptin to metformin therapy in patients with type 2 diabetes inadequately controlled with metformin monotherapy: a multicentre, randomised, double-blind, placebo-controlled study. Int J Clin Pract. 2009;63(1):46–55. Pratley RE, Kipnes MS, Fleck PR, Wilson C, Mekki Q. Efficacy and safety of the dipeptidyl peptidase-4 inhibitor alogliptin in patients with type 2 diabetes inadequately controlled by glyburide monotherapy. Diabetes Obes Metab. 2009;11(2):167–176. Pratley RE, Reusch JE, Fleck PR, Wilson CA, Mekki Q. Efficacy and safety of the dipeptidyl peptidase-4 inhibitor alogliptin added to pioglitazone in patients with type 2 diabetes: a randomized, double-blind, placebo-controlled study. Curr Med Res Opin. 2009;25(10):2361–2371. Rosenstock J, Inzucchi SE, Seufert J, Fleck PR, Wilson GA, Mekki Q. Initial combination therapy with alogliptin and pioglitazone in drug-naïve patients with type 2 diabetes. Diabetes Care. 2010;33(11):2406–2408. Del Prato S, Barnett AH, Huisman H, Neubacher D, Woerle HJ, Dugi KA. Effect of linagliptin monotherapy on glycaemic control and markers of β-cell function in patients with inadequately controlled type 2 diabetes: a randomized controlled trial. Diabetes Obes Metab. 2011;13(3):258–267. Taskinen MR, Rosenstock J, Tamminen I, Kubiak R, Patel S, Dugi KA, Woerle HJ. Safety and efficacy of linagliptin as add-on therapy to metformin in patients with type 2 diabetes: a randomized, double-blind, placebo-controlled study. Diabetes Obes Metab. 2011;13(1):65–74. Forst T, Uhlig-Laske B, Ring A, Graefe-Mody U, Friedrich C, Herbach K, Woerle HJ, Dugi KA. Linagliptin (BI 1356), a potent and selective DPP-4 inhibitor, is safe and efficacious in combination with metformin in patients with inadequately controlled Type 2 diabetes. Diabetic Medicine. 2010;27(12):1409–1419.